The Cooper Union tuition debacle wasn’t the only college protest this week. Students at Atlanta’s Emory University occupied an administration building earlier this week (right) to protest, and perhaps try to reverse, university’s decision to cut several programs. Students recently agreed to end the occupation. The meeting began around 3 p.m. and ended around 6:30 p.m. Afterward, students voted to end the occupation after Wagner agreed to meet with them at a future date…. The protest was just the latest response to what has been three months of campus outrage since Dean Robin Forman announced several programs would be closed, including journalism, physical education and visual arts. 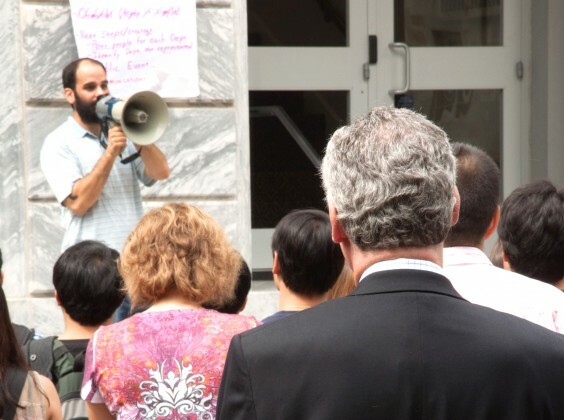 Students and faculty apparently objected to the manner in which the university decided to eliminate the programs, which Emory says were “not prompted by finances.” The school, according to protestors, held discussions about program elimination in secret.